Appliqué diamond medallions with pieced borders were found in Virginia, the quiltmaker’s birthplace, and sometimes in South Carolina, where she moved as a child. Mary Lester probably saw Virginia quilts growing up, and repeated this style in her own quilt. The quilt was probably made over a period of time in both South Carolina and Georgia. Mary Lester married in South Carolina in 1820. Around 1828, her family moved to Gwinnet County, Georgia, territory still held by the Creek Nation, or Muskogee. Two enslaved women, probably a mother and young daughter, listed in the household in the 1830 census probably assisted with the quilt. Copperplate-, block-, and roller-printed and solid cottons; silk embroidery thread; cotton filling and backing The center uses red copperplate-printed (“toile de Jouy”) cotton and early block-printed chintzes. These fabrics date earlier than the roller-printed cottons in the swags and borders. 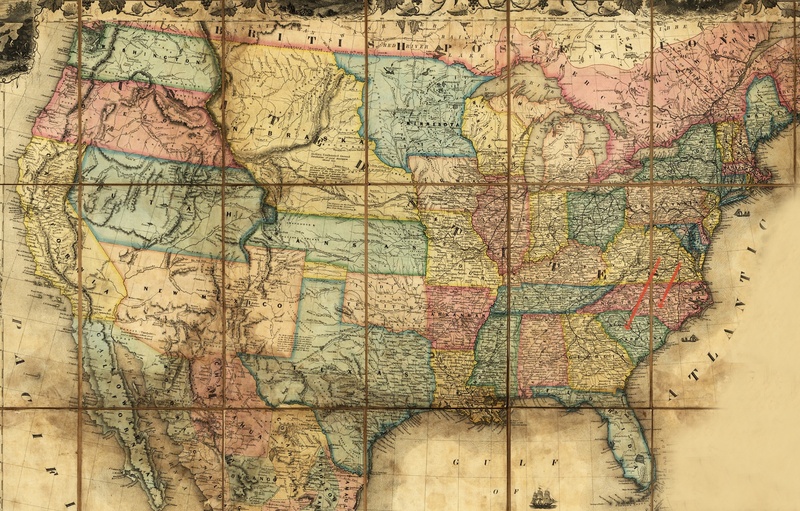 Lester probably began the center in the 1820s and finished in the 1830s with the borders. The bird at the very center is the same as the one in the New Jersey quilt, also in this section.